Our garden furniture doesn’t seem to have had much use this summer; we normally try and eat outside quite a lot, but the weather just hasn’t been tempting enough. Of course in true Too Lazy style, the garden table is still sitting out on the grass, where we left it a couple of months ago. Various things get dumped on it, including the occasional hedgehog feeding bowl, which fills up every time it rains. 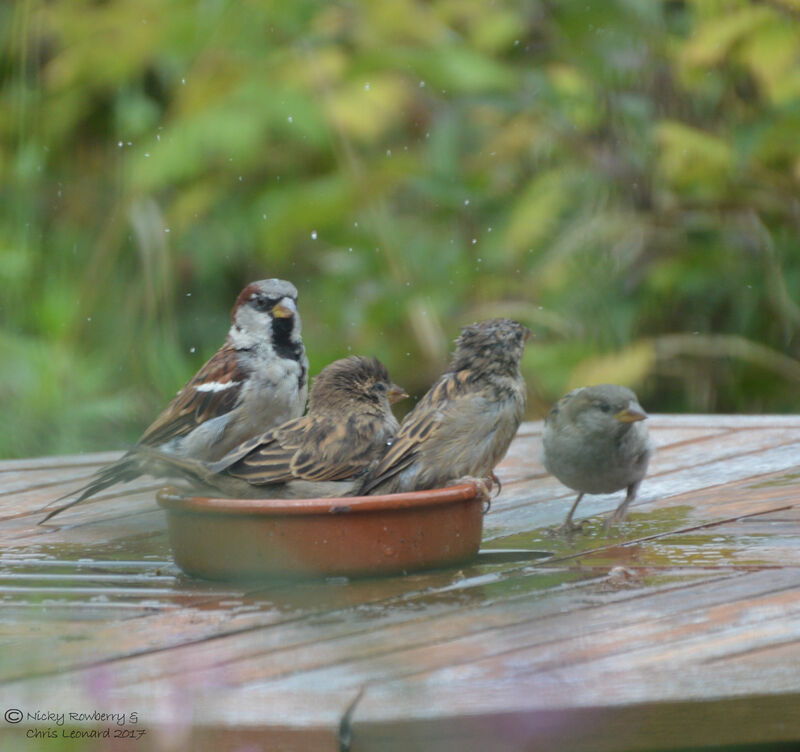 The sparrows had taken to using this as an impromptu bird bath, cramming themselves into the small dish with barely room to flap a wing. 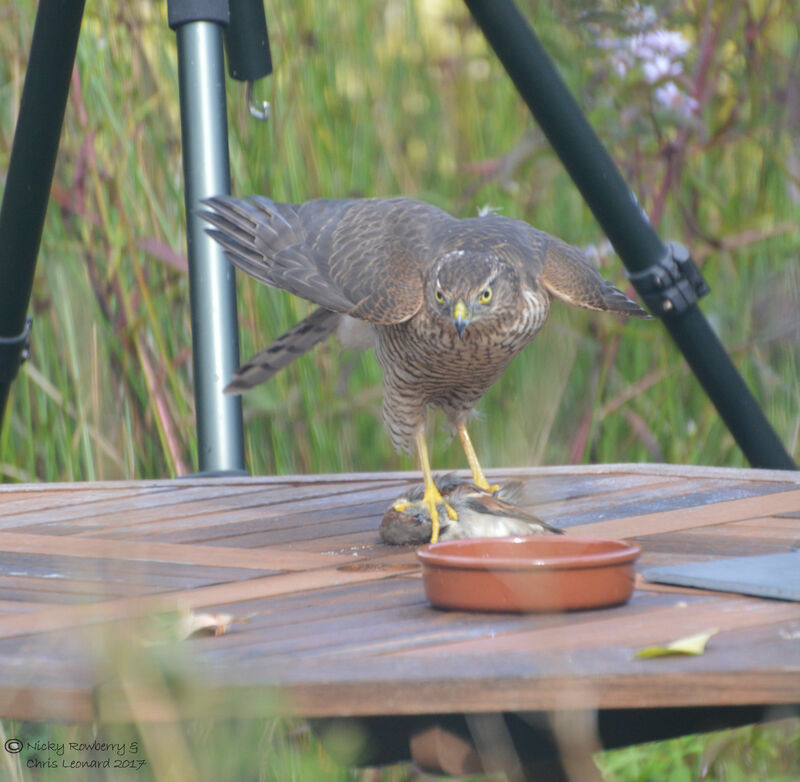 Today though I looked out to see that one of the unfortunate sparrows was suffering an altogether different experience on our table – he had become lunch for our local sparrowhawk. 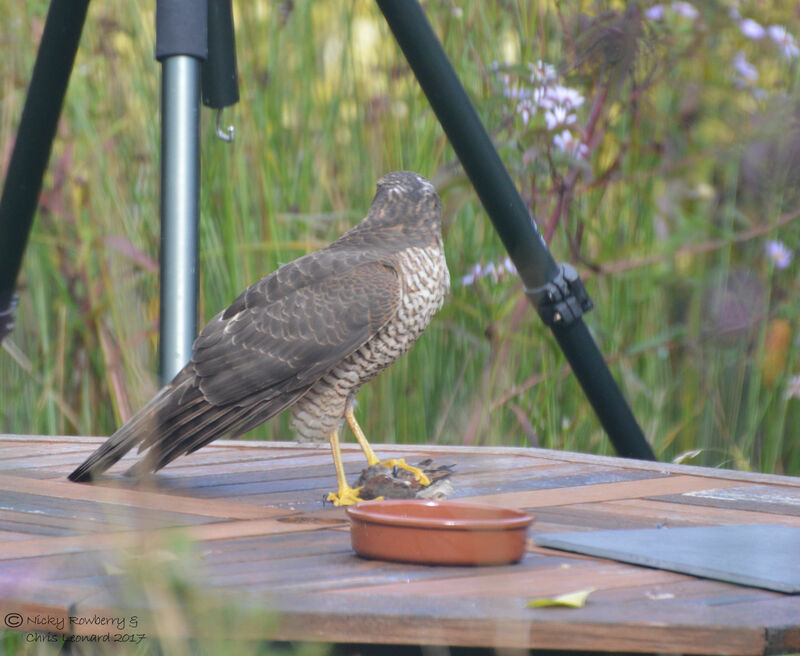 My first thought was guilt that I’d encouraged the sparrows, only for this one to become today’s special on the sparrowhawk menu. 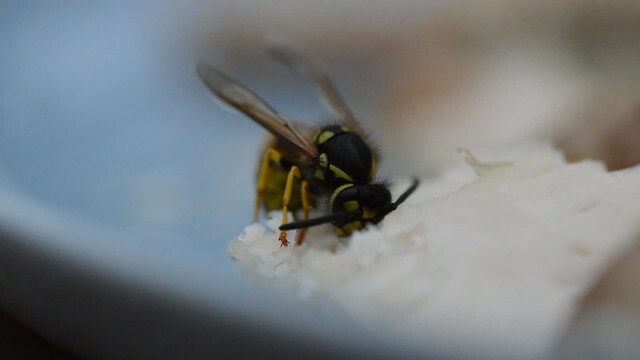 My second thought was can I get the camera in time? And for once I did. 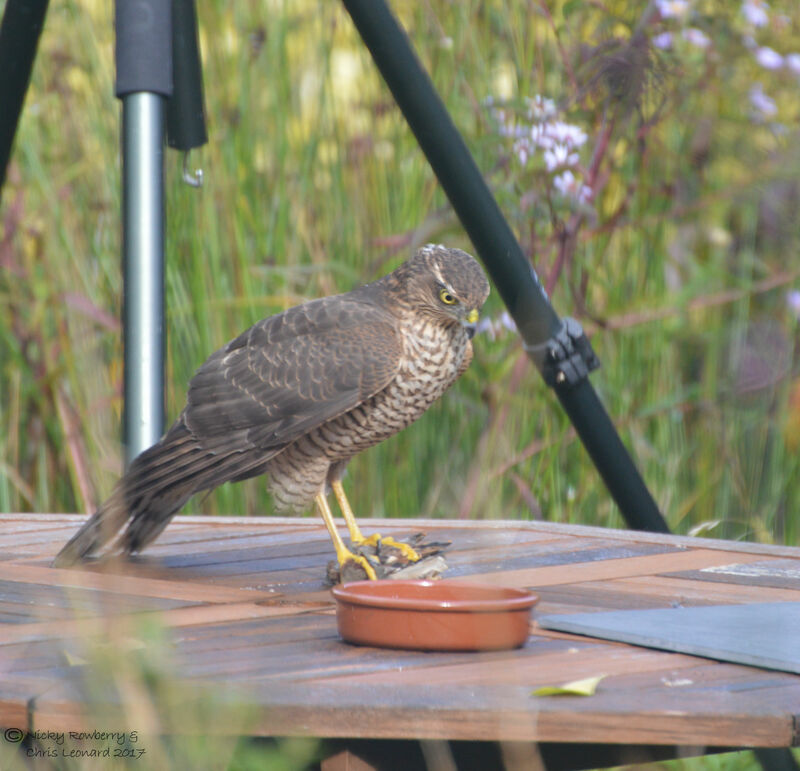 Not the finest set of photos; there was nothing I could do about the bits of grass and weeds obscuring the view, I just had to snap away getting as close as I could before the sparrowhawk spotted me. 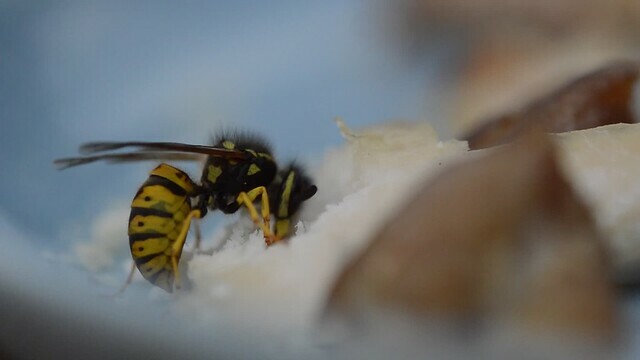 Thankfully the window cleaner had been literally an hour before, so I could at least see out of the patio door; the photos would have been a lot blurrier otherwise. The black tripod visible behind the table had the trail camera set up on it. Needless to say, the trailcam was pointing in the opposite direction and missed all the action! 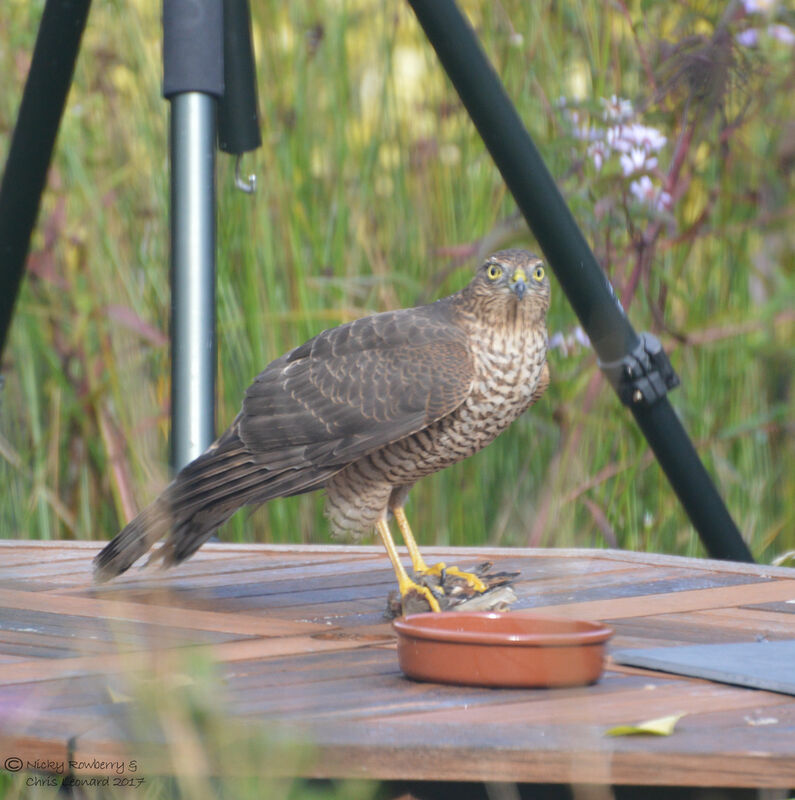 I headed out into the garden a bit later, not really expecting much after the excitement of the sparrowhawk. 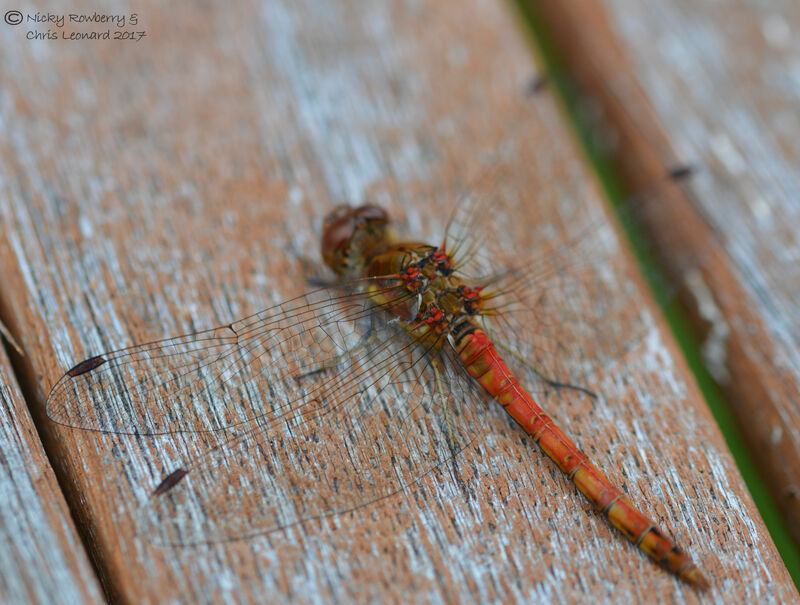 It may not have been quite so dramatic, but I was chuffed to find a Common Darter resting on the table – in almost the same spot the sparrow had met his unfortunate end. 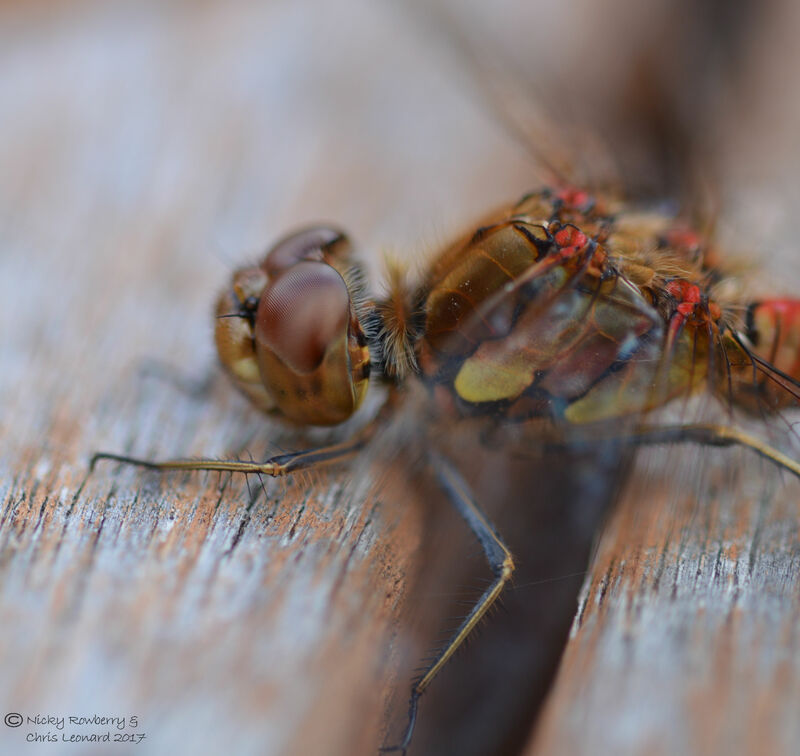 I never find it very easy to get all of a dragonfly in focus, so having failed a bit on the full body angle, I tried focussing on its head and the amazing compound eyes. 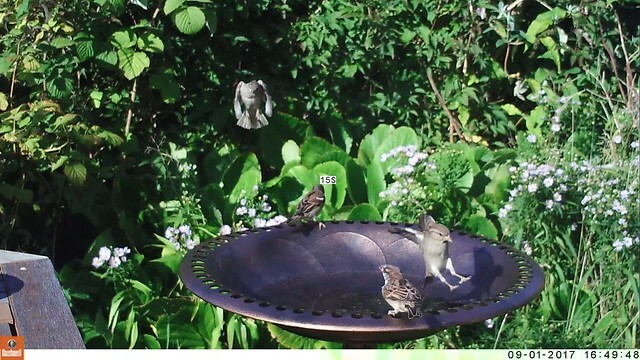 The sparrows don’t actually need to be using the tiny terracotta bowl as a bird bath. 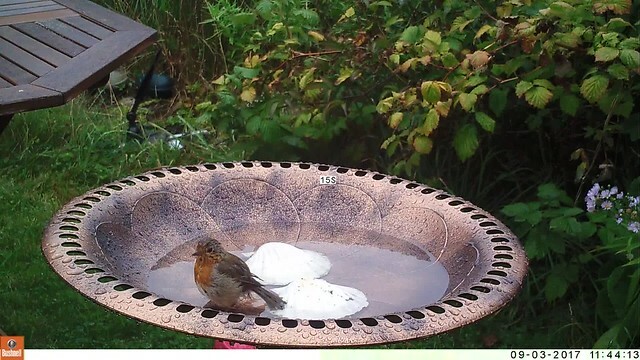 Having seen them all squashed in there, I had bought them a more spacious bird bath and put it right next to the table. They don’t seem that keen on it and are a bit wary of the slippery sides. I’ve yet to see one bathing in it, although they did have a tentative paddle a few weeks ago. Our robin however has taken to the new bathing facilities quite happily, maybe because he doesn’t get jostled for space by the sparrows. So our garden table may not have seen much of me and Chris this year, but it’s still getting plenty of use from an assortment of winged wildlife! 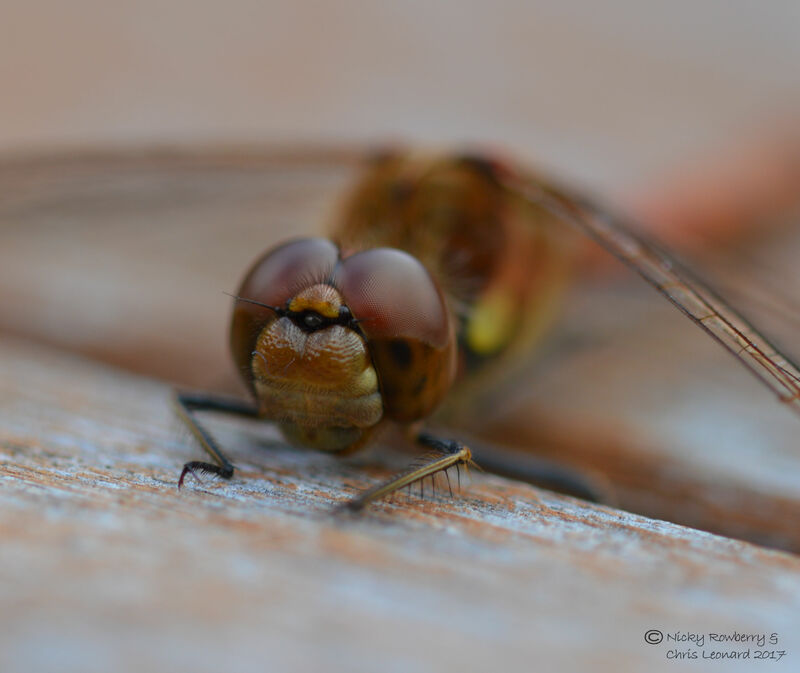 I was fascinated in seeing the detail in your photos of the Common Darter, particularly the wing detail, the colour, and the eyes and legs. Thanks for these close-ups! Glad you liked them. Wish I could master getting the whole dragonfly in focus though! !